I searched high and low for evidence of this, but I couldn’t find any good science to back it up. During any kind of strenuous activity — whether it be endurance, HIIT, or heavy weight lifting — the body burns through its glycogen stores. Glycogen, in essence, is a form of sugar. It’s stored in the muscles. It’s one of the body’s favorite fuel sources for exercise. The International Society of Sports Nutrition (ISSN) recommends that after a workout that depletes muscle glycogen (so after about one hour of higher intensity), you eat a meal composed of 3:1 carbohydrate:protein. When you do so, insulin and growth hormone levels rise, and testosterone levels fall. This increases muscle protein synthesis and decreases muscle soreness while at the same time maintains a healthy hormone balance. Cortisol and luteneizing hormone seem to stay the same in women, which demonstrates that it is not hormone levels in general that fall when you eat post-workout, but testosterone levels specifically. Testosterone is important for a lot of functions in the female body. However, excess testosterone can cause infertility, PCOS, cystic acne, male pattern hair growth on the face and body, hair loss on the top of the head, and reduced libido. Back to my critical thought process, we also know that chronically high insulin levels can also cause an increase in testosterone production form the theca cells of the ovarian cells, as well as the adrenal glands. 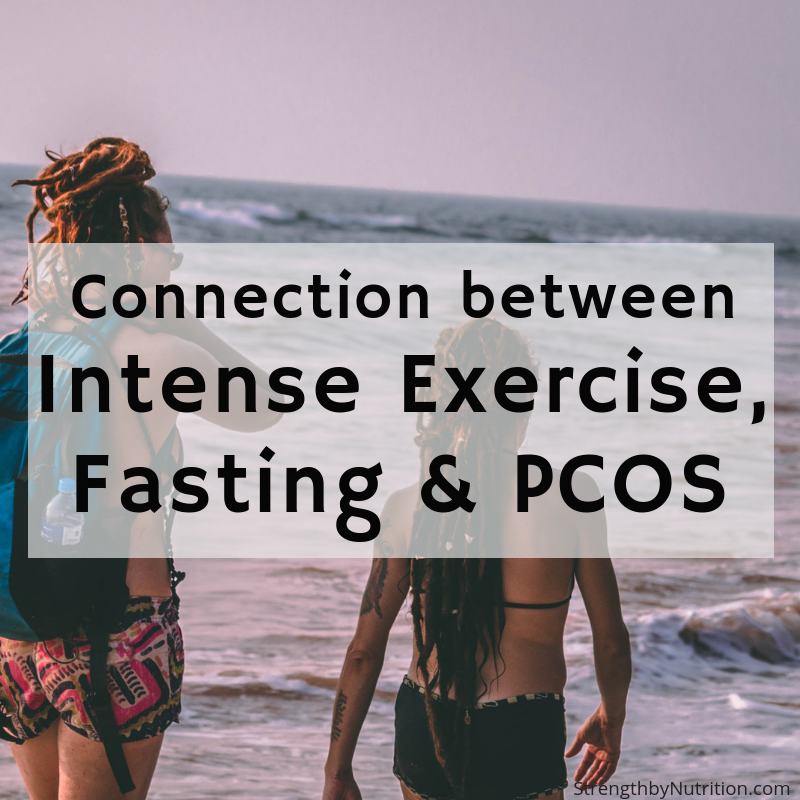 This mechanism explains the connection between insulin resistance, excessive testosterone, and PCOS in women. As a result of insulin resistance, many body tissues will begin ignoring insulin signals (insulin resistance), your ovaries are among the few organs that will continue to remain sensitive to insulin. This stimulation causes the ovary to produce testosterone. In women with PCOS (and the chronic insulin overstimulation that accompanies it), this can lead to drastic increases in testosterone that are seen in women with PCOS. But does a short term increase in blood sugar and insulin from a post workout shake negatively affect the ovaries and adrenal glands in the same way that chronically over-stimulating them with coffee and doughnuts do? Many people deliberately fast after a workout in order to burn as much fat as possible. While this is a reasonable approach for some people on occasional, women who repeatedly fast after workouts can experience significant long-term testosterone elevations. If you are a woman experiencing the negative effects of high testosterone, you may want to consider a post workout meal containing a 3:1 carbohydrate to protein portion. An example would be at least 30 grams of carbohydrate(1 large banana or a half cup of rice) and 10 grams of protein (0.5 scoop of whey protein or 1.5 oz. white meat). Fasting after a workout very occasionally is okay. And it varies by individual. Nonetheless science doesn’t lie – a fasted workout decreases muscle growth, increases soreness, and elevates testosterone levels in women. We can’t say that a daily high intensity workout and limited fueling are the only cause of high testosterone levels. Most definitely they were not. We also have to watch our caffeine consumption along with simple sugar and carb intake at all other times of the day. Eating an appropriate amount of carbohydrates i the right form ensures we aren’t chronically elevating insulin to the point of insulin resistance and testosterone production from the ovaries. Rarely do I recommend women to be on a low carbohydrate diet, but with sound carbohydrate timing strategies around your workout in addition to decreasing the consumption of caffeine and simple sugars, you can decrease the amount of testosterone circulating in your body and thus may reverse some symptoms of PCOS.